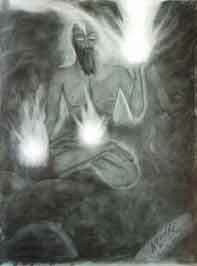 Siddhar Sages are the liberated mystical yogis who journey beyond ‘enlightenment’. The grace of self-knowledge, stillness and the highest purpose of life is attained through connecting to the Guru and the ancient lineage of light in experiential teachings of breath, resonance and yogic techniques. Much less is known of the yogic traditions of South India as it was guarded in secrecy and taught in the traditional manner of guru to the spiritually mature disciple. In most cases the enlightened beings went on to evolve into the final objective of yoga and that was to merge into God in the physical form itself. These sages were called Siddhars. Many of these Siddhars maintained spiritual diaries and writings in the form of poetry from the time they actualized into discovering the divine with deeper meaning and the beginning of their journey into yoga while attaining enlightenment, and to the final state of transforming into light, merging with the Supreme. There are different Siddhar schools with some believing in 18 masters and some as Siddhar Rajaswamy’s- 210 masters. According to the Siddhar teachings, these masters constantly take birth again and again with their disciples in different divine incarnations in different times and different places around the world constantly to keep up with the changing humanity needs and effecting change. For instance, Jesus Christ is said to have been Siddhar Pullipani having reincarnated. Swami Vivekananda was said to have been one of the reincarnations of Siddhar Thirumulanathar. Lao Tzu was claimed by Siddhar Bhogar to have been one of his incarnations. ‘Siddhars’ were evolved spiritual beings who went beyond enlightenment to accomplish the final yoga of attaining the ultimate perfection as becoming one with God. Perfection in this sense means the state of the highly evolved as Christ after resurrection. This is the ultimate objective of yoga in the Siddha philosophy. Yoga of Siddha tradition in South India meant the accomplishment of merging the body into the supreme light of the absolute as attainments of eight different dimensions of perfection. Each dimension of perfection is called a ‘siddhi’ and ‘siddhi’ is the miraculous powers that were acquired while practicing this path of yoga. Although spiritual traditions of Hinduism throughout India shun acquiring ‘siddhis’ due to the belief that acquiring siddhis would grow ego and therefore would withhold the spiritual progress of the yogi, the Siddha path insists on sheer restraint in using any siddhi while encouraging Siddhars to live in solitude or live disguised within a society as an ordinary householders. Siddhars consider attainment of various siddhis as grace which naturally flow into them through their yogic practices and it was held sacred as the mark of the divine presence within themselves. The realm of Siddhars is mystical, most times unbelievable and has remained unchanged over thousands of years. To envision this world, it is comparable to the life present in the extreme depth of the ocean existing under intense high pressure and total darkness, hardly ever disturbed by external forces. This would be an example to illustrate the world of the Siddhars beneath the known in Southern India which still vibrant and alive and yet far away from the rest of human civilization. These ancient spiritual places in South India, hidden from the rest of the world resonate with the presence of the Siddhars even today. Siddhar Patanjali, the author of Yoga Sutra, who was one of the disciples of Siddhar Bhogar, mentions of the this higher yoga which requires the effort of the spiritual aspirant to understand the deep insightfulness of this Siddha path through practice and patience for the true teachings beneath the simplicity of his writings to reveal. Historians have wondered whether there were three of more saints under the name Patanjali from between 200 BC to 250 AD while being able unable to comprehend that it could also be the same person. Siddhar Bhogar’s extensive writings in Tamil covers Ayurveda and yogic practices of Siddhars and much of which of his work has not been translated to English as yet. 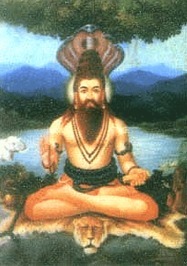 Siddhar Bhogar is also the guru to Maha-avatar Babaji (the eternal Siddhar mentioned by Paramahamsa Yogananda in his book Autobiography pf a Yogi). Siddhar Bhogar had in his spiritual diary made many claims with some that defy our logic and are astounding to the point of dismissing it offhand due to its implication in the modern day. One of his claims in his writings is that he went to Mecca and Medina and it was he who founded Islam. Could he have been the light Prophet Mohammed understood to be as angel Gabriel? Siddhar Bhogar did teach the Siddhar practice wherein one form of siddhi was the ability to leave the body and appear as light behind another person’s intellect to guide or enter in as life into another body. Siddhar Thirumulanathar, Siddhar Bhogar’s guru, writes in his divine poetry that he meditated in his body to attain light for a thousand years and then wrote a stanza of divine poetry each year of higher tantra, the yoga of light. He wrote 3047 stanzas!Siddhar Thirumulanathar’s writings, known as ‘Thirumandiram’ has many meanings. Thirumandiram means sacred magic, divine words, sacred mantras and /or sacred siddhi. These writings have now been translated to English. Thirumandiram teaches the science of attainment of light body, going beyond realization into realms of the Siddha philosophy. All eight forms of siddhi are explained and its way of attainments are taught too to enable the metamorphosis into the ‘perfect state’ as the basic objective of yoga. One of the forebears of Tibetian tantric yoga was Siddhar Nagarjuna, who is claimed to have been teaching in physical form for over 400 years, was a disciple under the Siddhar Thirumular lineage. 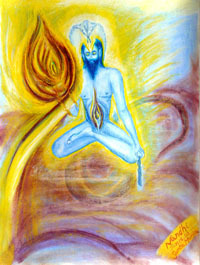 This higher yogic path was called in ancient Tamil, ‘Tantiram’, the root to tantric wisdom that is described as tantra. This divine tantra as revealed by the Siddhars meant breaking through ego arising though duality that separates us from the divine, by worshipping the three dimensional context in every thought arising as seeds of knowing from the mind. There are so many forms of seed thoughts such as – as perceiver, perceived and as perception; space, matter, energy; past, present and future; creation, preservation and destruction; and so on. Once the three dimensions of thought is understood and held sacred with the unity behind duality achieved, the mind would break into becoming single pointed. It would be natural for Oneness to emerge as Source with the Self illumined in knowing ‘All Is’ as “I am That’ and ‘I am’. 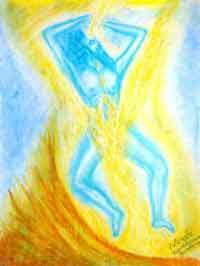 Merging into the Source was then the only grand reality as the destination of this yogic journey towards Light. With the soul recognized in its pure form as the ‘Holy Ghost’ and a divine teacher as Guru to guide knowing All as the Absolute nameless Father, the higher tantra manifests the primal urge for the divine union in the ‘trinity of knowing’. Applying this wisdom as yogic techniques within a spiritual environment to the single pointed mind and conditioned body, true yoga of the Siddhars taught that the eternal is attained with the wisdom of the mind along with intellect absorbed in divine grace, powerful enough to manifest its Light body! Within the context of Hindu myth the name Siddha originally denoted one of the eighteen categories of celestial beings. These beings of semi-divine status were said to be of great purity and their dwelling was thought to be in the sky between the earth and the sun. Later they became associated with a class of more adept human being, often an accomplished yogi. The term had been derived from the Sanskrit root sidh meaning “fulfillment” or “achievement,” so the noun came to refer to one who had attained perfection. Because the Tamil language lacks the aspirated consonants of Sanskrit the word has been written and pronounced by the Tamils as cittar. All of the writings of the Tamil Siddhars, whether defining philosophical viewpoints, yogic practices, or presenting alchemical recipes for herbal tinctures and base metal amalgams were presented in poetic form, often employing the more difficult meters that harkened back to the ancient Tamil Sangam Age. These works are also riddled with tantric imagery, references to Kundalini, and clues to control the dangerous feminine power through breathing practices or the recitation of the Goddess’s secret names. Because of the enigmatic nature of the Siddha imagery, and their philosophy structured in direct defiance of human logic, few scholars have ventured to address the Tamil Siddhars and then often only as mere curiosities. Needless to say, the vast majority of the Tamil Siddha works have never been translated, as has been the case with some of the verses presented here. One of the most basic characteristics of Tamil composition, and one that is particularly relevant to Siddha poetry, is the tendency to layer the work so that each word or image builds upon the last. Because each component image is presented so as to be viewed autonomously and in relationship both sequentially and to the totality of the verse, the images of the poem may seem slightly disjointed and contradictory. Though this may at first seem to undermine the aesthetic quality and over-complicate the simple act of enjoying poetry, the Tamil Siddha compositions pattern the imagery to expound the subtle complexity of their philosophical concepts or to map out the terrain of the inner landscape which is dominated by the dormant serpent energy.